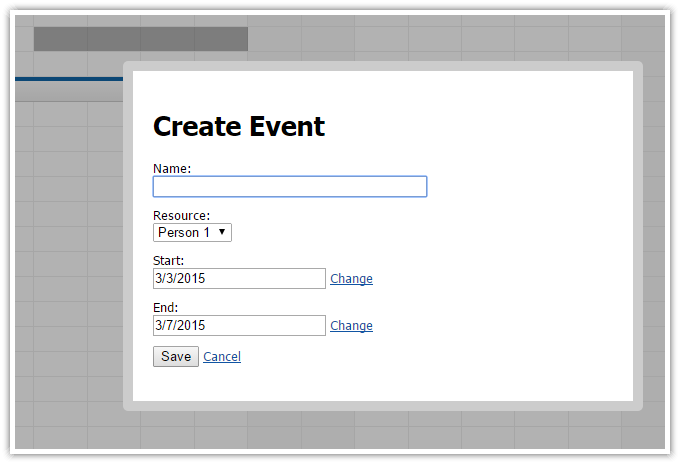 AngularJS web application for scheduling events for multiple resources (people, tools). Supports drag and drop scheduling. Sample PHP application with source code. AngularJS/HTML5 project with source code. PHP/SQLite backend. Buy a license to get a bundle of fast scheduling components with source code. This attribute lets us specify the Scheduler configuration object. The configuration object defines properties and event handlers of the scheduler control. The duration of each scheduler grid cell will be one day. The first day will be set to the first day of the current month). The scheduler will display this month. 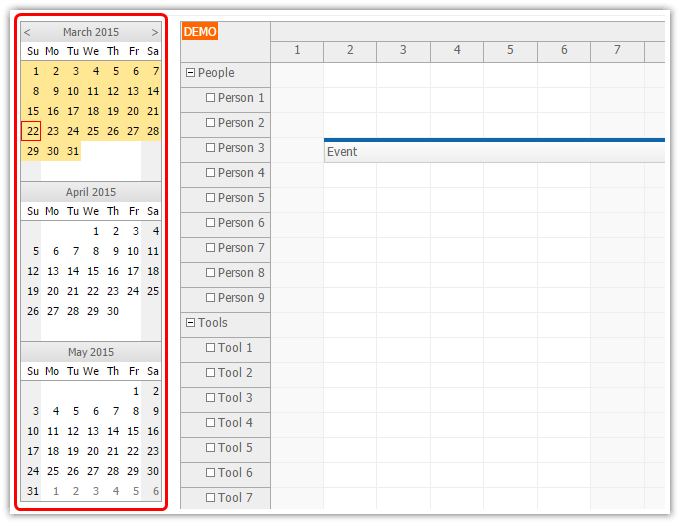 This attribute lets us specify the array of events that will be displayed in the scheduler. 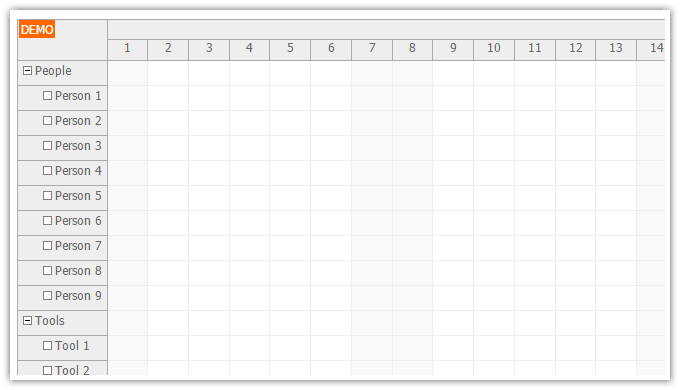 The scheduler time header will display two rows. The first row will display months, the second row will display days. You can also disable the parent resources [doc.daypilot.org] so they can't be used for placing events. This script returns a JSON array with the resources. The actual events/reservations will be load using loadEvents function. It save the event data in $scope.events - the scheduler will detect the changes and reload the events. The backend_events.php script returns the event data in a JSON array. The AngularJS scheduler allows moving events using drag and drop. This feature is enabled by default. Whenever the user moves an event, the scheduler fires onEventMove and onEventMoved events and updates the position. We will use onEventMoved event handler to notify the server about the change. The backend_move.php script updates the database on the server side. The scheduler lets users select a time range in the grid. It fires onTimeRangeSelected event when the selection is complete. We will handle this event and open a modal dialog where the user can enter the new event details. The event will be saved in the database and the scheduler will be refreshed. The event_create.php script displays a dialog box with event details pre-filled using the selected area (the parameters are passed to the modal dialog using the query string). Now we will add the Navigator control that will let the users switch the visible month. AngularJS web application that displays a timesheet for a team of people working on multiple projects. It uses automatic AngularJS data bindings to display the timesheet records. Includes a sample project with PHP/SQLite backend. AngularJS web application that shows how to create a simple event calendar solution, displaying day and week view and date selector. Supports drag and drop event moving and resizing, event editing using a modal dialog. JSON-based PHP server-side backend. How to create an AngularJS hotel room booking application using AngularJS scheduler plugin. Includes PHP backend (SQLite, MySQL). HTML5 scheduler with drag and drop support. Displays a timeline for multiple resources grouped by category. Sample PHP project with AJAX backend implementation. Sample AngularJS application for scheduling and managing doctor appointments. Includes public interface for patients and private interface for doctors and shift managers. Includes a PHP backend. Simple web application that displays tennis court availability and lets the users create a reservation using drag and drop. Includes a PHP project with sample SQLite database. PHP web application for machine/production job scheduling. Displays job assignments using a scheduler HTML5 component (including duration and dependencies). Works with MySQL database. How to create a timesheet using the HTML5 timesheet/scheduler component. Sample PHP application for download.